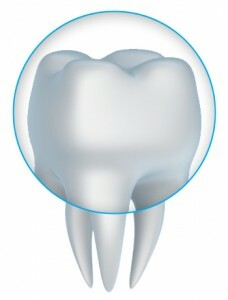 A dental crown, also referred to as a cap, is used to reinforce a weakened tooth. Our metal-free all-porcelain crowns look and feel completely natural. Dental crowns can help if you have cracked, chipped, broken, or discolored teeth. Porcelain crowns support and reinforce natural teeth. Porcelain crowns feel completely comfortable. Porcelain crowns can be cared for just like the rest of your natural teeth. Porcelain crowns are individually made to fit perfectly. Porcelain crowns can help fill gaps and can correct cracked, chipped, broken or discolored teeth. Porcelain crowns can be used to secure other teeth appliances. First your remaining tooth will be sculpted so that the porcelain crown can be bonded to the natural tooth. While your custom dental crown is being created we will place a provisional crown. After your dental crown is finished, it will be bonded to your natural tooth. If you want to know more about porcelain crowns, contact our Solana Beach office and set up a consultation. Please call us at 858.755.1189.